The X1-PCB is a pc board level remote-control-only variant of the X1 hand held meter. It is supplied in a single printed circuit board design and needs to be shielded through integration into an EMV protective housing. The X1-PCBC version is pre-packaged into a compact metal housing. Both versions provide a socket for the connection of light detectors with Gigahertz-Optik -4 type connectors as well as a USB socket. RS232 connection is implemented through soldering points on the board. 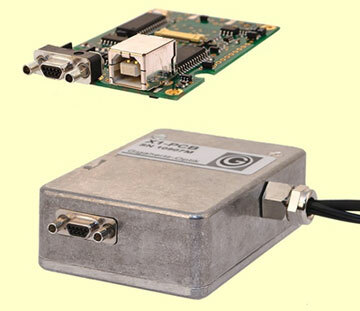 Both are microprocessor-based measurement devices that are combined with light measurement detectors to measure light in different quantities. A unique feature of the X1 series is the capability to operate multi-cell detector heads set up with up to four photodiodes with all four signals read out by the remote interface. The flexibility to combine the X1's with most of the Gigahertz-Optik light detector heads enable them to be used in a wide application range of radiometric, photometric and colorimetric measurements. The X1-PCB and X1-PCBC offer a high linear current to voltage converting amplifier with seven manually or automatically selected gain ranges. The max. error within this wide dynamic range is 0.2 %. The four signal inputs are operating in multiplex mode with one amplifier. The device is powered with 6 - 20 VDC. Call Us Today At 1-978-462-1818.